WATERLOO - Austin David Andrews, 90, of Waterloo, died Monday, April 16, 2007, at Covenant Medical Center. 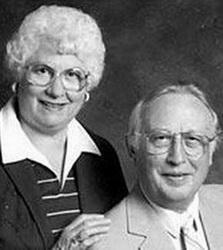 He was born Oct. 4, 1916, in Waterloo, son of Austin Parvis and Gertrude "Clara" Lenz Andrews. He married Annette "Toni" Hutton on Aug. 4, 1942 in Columbia, S.C.
Mr. Andrews worked at Black Hawk County Abstract Co. for 33 years, retiring in 1984. He served in the U.S. Army Air Force during World War II as a B25 bomber pilot. Survivors include his wife; a son, David (Wendy) of Marion; a daughter, Kathy (Gary) Edwards of Marengo; four grandchildren, Kari Edwards of Baraboo, Wis., Joshua Andrews of Golden, Colo., Jacob (Shawn) Andrews of Surprise, Ariz., and Nathan Andrews of Glendale, Ariz.; and three great-grandchildren, Abigail, Aidan and Anya Carlson-Edwards of Baraboo. Preceded in death by a grandson, Aaron Austin Andrews. Memorials may be directed to the Cedar Bend Humane Society.